California’s farmers who produce our food are especially vulnerable to the state’s increasing water insecurity. The “precipitation whiplash” the state experienced in recent years is a phenomenon that climate scientists anticipate will increase in frequency and severity in the decades to come. One recent academic literature review by six UC researchers found that by the end of the century, California can expect a 50 percent increase in the number of severe droughts, a 50 percent increase in the number of severe flooding events, and a potential 65 percent loss in snowpack (Pathak et al., 2018). New policies passed in the past eight years have laid the groundwork for long-overdue groundwater management, nitrate pollution reduction, and investments in on-farm water use efficiency. In 2014, under an emergency drought declaration, Governor Brown authorized a new program called the State Water Efficiency and Enhancement Program (SWEEP). The program’s funding comes from the state’s cap-and-trade and bond revenue and is used to make grants to farmers and ranchers for practices that reduce both water and energy use. Coordinated by CDFA, SWEEP funded over 600 projects in 33 counties between 2014-2017. SWEEP provides cost-share grants to growers to install more efficient irrigation systems, including subsurface drip irrigation, solar-powered pumps, and remote soil moisture monitoring equipment. Not surprisingly, the program has been very popular with farmers—during the first six grant rounds, almost three times more applications were received than were funded. Read more information on SWEEP. In 2014, the legislature passed the Sustainable Groundwater Management Act (SGMA), a package of bills requiring local governments to monitor and regulate groundwater usage. Since then, many local groundwater sustainability agencies have formed and are in the process of developing groundwater sustainability plans. Learn more about SGMA. ILRP was established in 2012 to prevent further contamination of surface and groundwater through grower education, required nutrient management planning and reporting. Learn more about ILRP. In 2014, voters approved Proposition 1, a $7.5 billion bond that included funding for on-farm water conservation that CalCAN advocated for in the bond. $30 million in grants were made in 2016 by the Department of Water Resources for a range of training, technical assistance, and demonstration projects. In 2018 , Proposition 68 was passed by voters, authorizing a $4.1 billion natural resources bond. 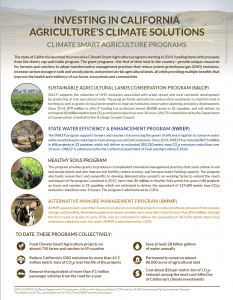 Included in the bond and supported by CalCAN was one-time funding for SWEEP of $20 million, $10 million for the Healthy Soils Program and $20 million for the Farmland Conservancy Program.